Ready to become a gym owner but not sure where to start? 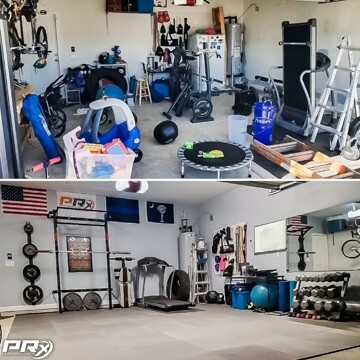 Follow these simple steps to create the gym of your dreams! 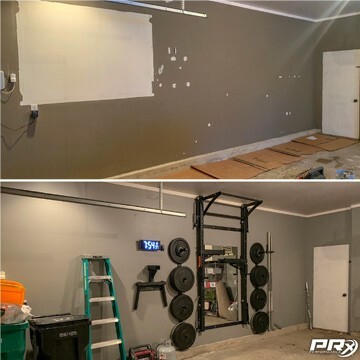 * If you do not have the recommended ceiling heights, call us [701-566-0452] or email us at [sales@prxperformance.com] We can make a lot of different heights work by modifying your installation. All of our racks require either 16" or 24" spaced studs. If your studs are unevenly spaced, a stringer board will be needed to install. Our folding bench requires 16" spaced studs. If your studs are 24" or unevenly spaced, you'll need a stringer board. All of our Storage Solutions require at least one stud to attach to, a select few require two studs. While our racks are designed to mount to wood studs they can also mount to other wall types. 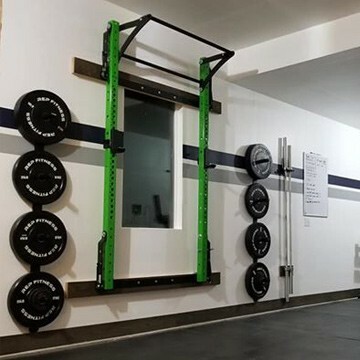 For more information about mounting to concrete, block, or metal studs we ask that you email us at sales@prxperformance.com. Because we specialize in mounting to wood studs, we also recommend consulting a professional installer in your area. We can easily accommodate a sloped floor with our Leveling Kit! 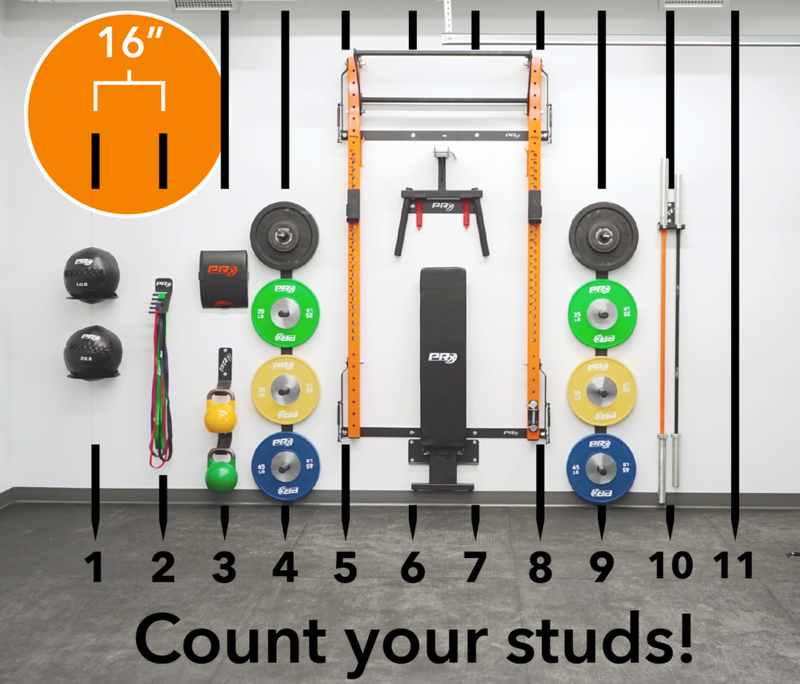 Select a rack and some accessories based on your space and how many studs you have available! This photo of our His & Hers PRO Elite package takes up approximately 10 studs spaced 16" apart. All racks measure 52" wide and mount to either three or four studs (dependent upon 16" or 24" spaced studs). Takes up 49" of wall space and will mount to either 3 or 4 studs (depending upon if your studs are spaced 16" or 24"). Stands 27" out from the wall when deployed. Folds up to store 7" from the wall. Our folding bench mounts directly between your PRx rack uprights with 16" studs. If you do not have 16" spaced studs you will need a stringer board to install the bench. Dimensions Deployed: 18" x 19" x 63"
Dimensions Stored: 18" x 5" x 61"
3-Peg Weight Storage: weight plate diameter x 55.5" x 8.5"
4-Peg Weight Storage: weight plate diameter x 75" x 8.5"
Single Bar Storage: 3" x bar height x 4"
Double Bar Storage: 3" x bar height x 4"
Medicine Ball Storage: 12" x ball diameter x 12.5"
AbMat Storage: 12.5" x 15" x 2.5"
Chalk Bowl: 12" x 8" x 12.5"
Mobility Band Storage: 6" x 41" x 4.5"
Kettlebell Storage: ~12" x ~23" x ~12"
Battle Rope Storage: 3" x 11.5" x 7.5"
Almost all of our orders are shipped by FedEx Ground. Be sure to track all your packages using the "Multiple-piece Shipment" tab. 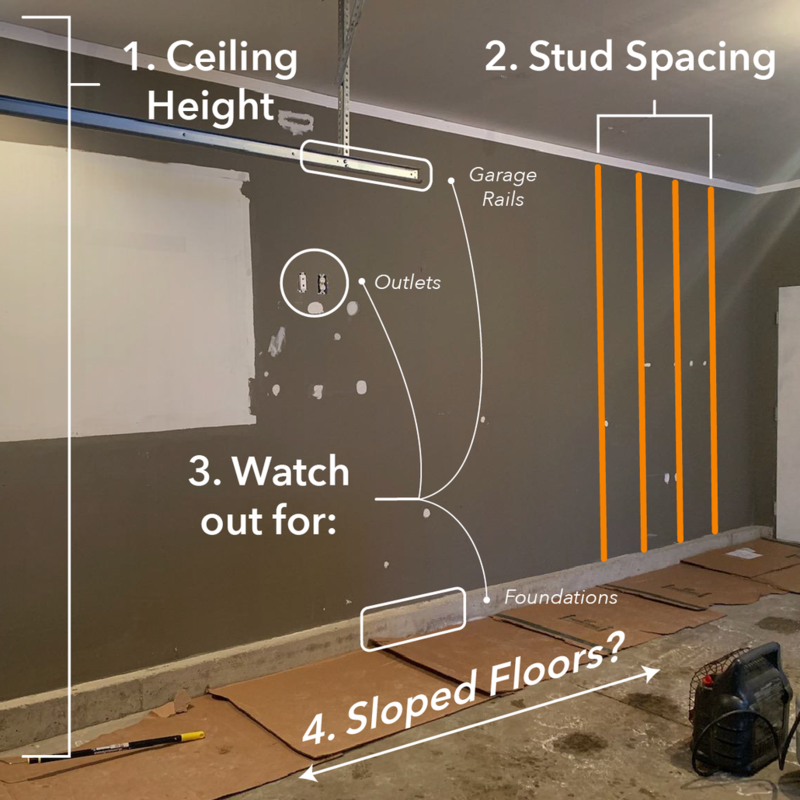 Mark your studs, gather your tools and download your instructions! Our racks are easy to install. 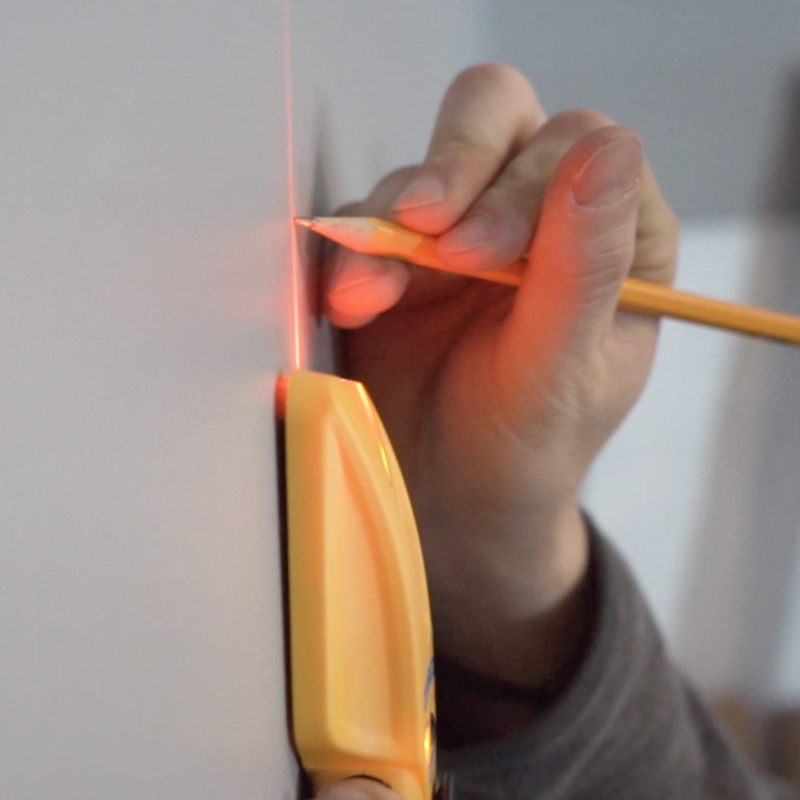 Just level and align your wall brackets, then secure them. After that all that's left is tightening some bolts! Once you hit submit in the checkout, you'll receive an order confirmation email. We strive to get every order sent out in 2-3 business days. As soon as we print your shipping label you will receive a shipping confirmation email with your tracking information. Most of our orders go through FedEx Ground. 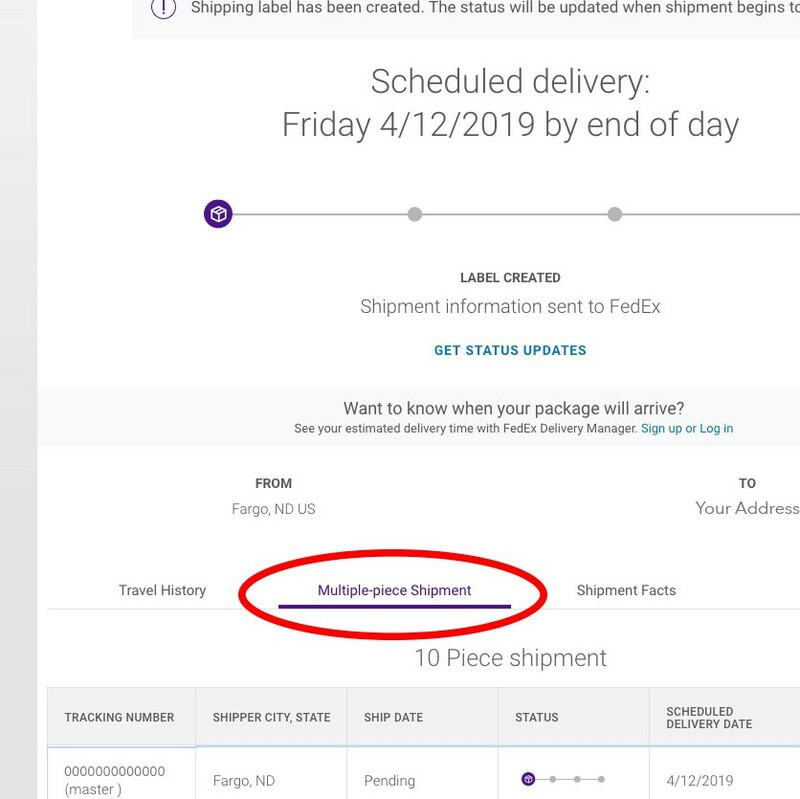 When tracking your packages on the FedEx website, be sure to click the "Multiple-piece Shipment" tab for accurate tracking information on your entire order. Check out your rack instructions and see what tools you'll need! 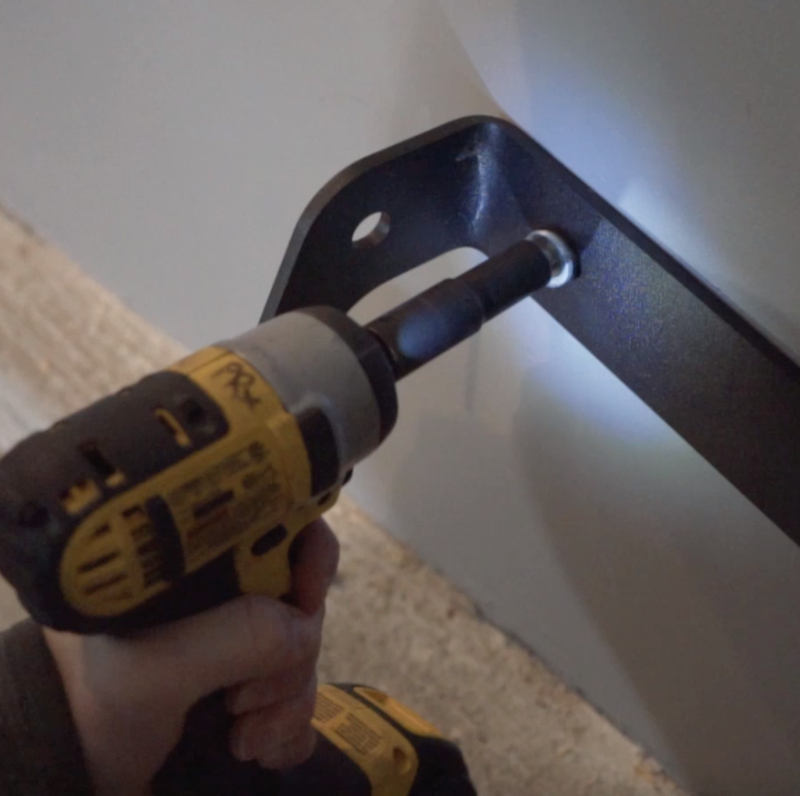 All wall mounted accessories require one drill, one 3/16" drill bit, one 1/2" socket and maybe a level and tape measure. If you need a stringer board, grab one from a local lumber store so that you are ready to assemble as soon as you get your equipment. Rack installations take between 2-3 hours (but can be shorter). Installing storage accessories takes about 10-20 minutes per accessory. If these times seem exaggerated it's because they are. We purposely made sure to factor in enough time for you to read, and understand the instructions as you complete the process! Think of these numbers like your last PR; easy to beat as long as you stay the course.